A crowd of residents wait to get tickets for Friday’s visit by Michelle Obama in Fredericksburg, Va.
Hey everyone, I’m waaaaaaaaaay behind on the news today, will try to catch up tomorrow. AP: U.S. consumers stepped up their spending on retail goods in September, a hopeful sign for the sluggish economy. They spent more on autos, clothing and furniture last month to boost retail sales 1.1 percent, the Commerce Department said Friday. It was the largest gain in seven months. Auto sales rose 3.6 percent to drive the overall increase. Still, excluding that category, sales gained a solid 0.6 percent. The government also revised the August figures to show a 0.3 percent increase, up from its initial report of no gain. Stocks rose after the release of the report, which is the government’s first look at consumer spending each month. The Dow Jones industrial average climbed 87 points in afternoon trading. Broader indexes also rose. A separate Commerce report showed that businesses added to their stockpiles for a 20th consecutive month in August while sales rose for a third straight month. The increase suggests businesses were confident enough in the economy to keep stocking their shelves. AP: Transportation Secretary Ray LaHood, the most prominent Republican in President Barack Obama’s administration, accused GOP House members Friday of putting their hope for the president to fail ahead of working toward solving the nation’s problems. Paul Krugman: Reading the transcript of Tuesday’s Republican debate on the economy is, for anyone who has actually been following economic events these past few years, like falling down a rabbit hole. Suddenly, you find yourself in a fantasy world where nothing looks or behaves the way it does in real life. …. the G.O.P. has responded to the crisis not by rethinking its dogma but by adopting an even cruder version of that dogma, becoming a caricature of itself. During the debate, the hosts played a clip of Ronald Reagan calling for increased revenue; today, no politician hoping to get anywhere in Reagan’s party would dare say such a thing. Greg Sargent: By now you may have heard about that 78-year-old grandmother who is fully against Ohio’s new push to roll back collective bargaining rights for public employees – but who had her words brazenly torn out of context and put into an ad advocating for the measure. The tale has gone national. And now the story is about to get even bigger: The grandma is set to appear in a pro-union ad denouncing the anti-union forces as “desperate” for stealing her words. This will likely earn much more attention to a fight which is now being viewed nationally as yet another major referendum on whether the right will succeed in breaking labor in the industrial heartland. Could this blunder by the anti-union forces be decisive? Labor hopes so…. Washington Post: As a result of stimulus spending and increased funding through the 2010 health-care law, the number of clinicians participating in a federal program to expand access to care in under-served communities has nearly tripled in the past three years. About 10,000 doctors, nurses and other providers now participate in the National Health Serv­ice Corps, the highest number since the program was established in 1972….Officials estimated that the corps is serving about 10.5 million patients. 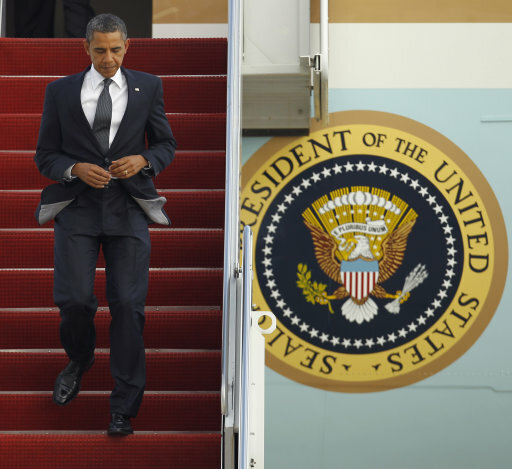 President Barack Obama boards Air Force One before his departure from Andrews Air Force Base, April 20.